Most of the average Metal crowd seems to know very well Marty Friedman from his MEGADETH days. Personally my heart is elsewhere. Indeed his early works with Jason Becker & CACOPHONY are unmatchable in terms of pure cleverness, virtuosity, smart songwriting, genuine musicality, extreme playing, and inventive shreds. His first full instrumental solo album “Dragon Kiss” (1988) will remain for ever in my top 20. Its technical potential was and still is stellar demonstrate an unique personnality, with maybe his alter ego "Perpetual Burn" also from Shapnel Records only as a serious contender. Of course “Rust In Peace” (‘90) or “Countdown To Extinction” in 1992 were fine, but once again in my deepest mind I was more attracted by his underrated discs, that were released in between, like the ambiant but superb “Scenes” or “True Obsessions”. Even the much depreciated albums released after his MEGADETH departure such as "Bad DNA" or 2006’s "Loudspeaker" were very interesting as far as i am concerned, the live album "Exhibit A - live in Europe" is also truly underestimated…Time to fix your deficiencies my friends! 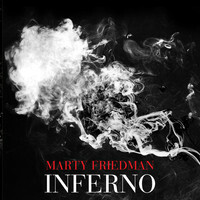 With this new album “Inferno” Mr. Friedman gonna satisfy everyone, providing a fantastic collection of high octane Modern Metal songs for the Teenage Headbanging audience and on the flip side, his traditionnal impressive signature playing is spread over Eight instrumental cuts in the most demanding style, yet able to reach the hyper space scale of the guitar hierarchy. I ‘m lucky enough to possess the Japanese Shm-Cd with Dvd. So i have the privilege to get two bonus tracks “Jasmine Cyanide” with some huge vocal parts from Dan Tompkins (TESSERACT / HAJI’S KITCHEN) & the instrumental “ballad of the barbie bandits” in it’s full studio version. A smart tip and a good value for money i think. The guest list is amazing with an impressive amount of talented guys, including some of the most regarded and reputed young musicians of the new Metal scene. The nice thing is, that Marty is sharing the songwriting effort with his musical invitees on each track. It seems to be an improved method in order to keep a new found focus for a result very valuable in diversity! The vocal tracks are an acquired taste, as the voice types are obviously quite different from one song to the other, from the great performance of REVOCATION’s David Davidson in “Sociopaths” to the punkish “I Can’t Relax”. All those are very different. The duo between Danko Jones & Alexis Laiho (CHILDREN OF BODOM) for "Lycanthrope" is addictive and fun, enriched by some ripping lead axe solos! The remaining majoritarian instrumental stuff is extraordinary, clever, challenging, still pioneering, even experimental. Notably on “Meat Hook” featuring Norwegian Saxophonist Jørgen Munkeby, from SHINING. His crazy Jazz lines work in perfect concordance with the frantic riffage onslaught, this sound is astonishing. One of my favorites. The mix with the Flamenco guitars of Rodrigo & Gabriela is less innovant but still enjoyable (“Wicked Panacea”)! But one of the best along with “Inferno” is “Horrors”, born under a songwriting collaboration with Jason Becker. It is their first since their CACOPHONY times, and it’s definitively the return of the old magic of this unrivaled dual guitar unit (while Becker’s parts are performed by Ewan Dobson) with notably a counterpoint in their legendary fashion. A solid density in the orchestrations and the clean middle section being so typical and jubilant (read “Air” meets “Floating World”), before turning in a smoking candenza for a breathtaking grand final! Another jewel to add to a splendid crown that belongs to the king of the Modern guitar, the one and only Marty Friedman!